Any time I go on a date — or to any event that results in someone staring at me and my lips — I follow a very specific rule of thumb: never wear a bold lip. Why? I know that taking several bites of gnocchi or even snacking on hors d’oeuvres will melt my lipstick right off my lips, leaving behind an unattractive outline of crusty color. It’s quite the conundrum, but I recently found a stain that lets my bold lip flag fly with pigment so long-wearing, it lasted all the way through dinner. 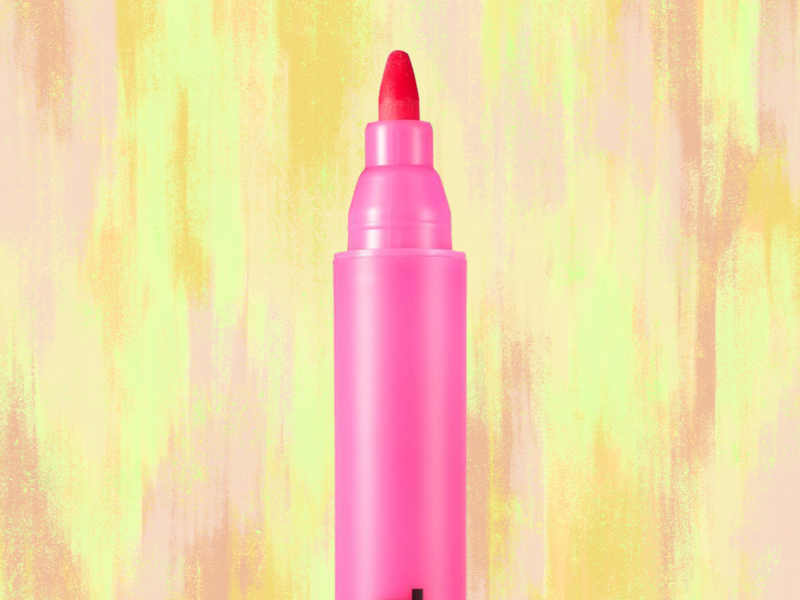 Enter: TPSY Dash Lip Marker. Even better: It’s super easy to apply. Whenever I need to touch up my lipstick in the middle of the evening, my deep appreciation for happy hour means staying in the lines is that much harder. But this felt-tip marker makes application a breeze, whether you have a mirror or not. The best thing about TPSY’s Dash Lip Marker, though, is the formula. The marker fluid is just like a Sharpie highlighter, or a really good liquid eyeliner. Plus, as soon as I applied it, it dried almost instantly in a thin layer of pigment that’s sheer, but can easily build up to an intense shade. The options are basic, but they are kind the kind you’d typically want in your every day rotation: Crazy Rabbit (orange), Felt Pink (pink), Sassy Cat (hot pink), Playhouse (berry), and Reliability (red). Ringing in at $16 on Nordstrom’s site now, these will definitely cost you more than a 6-pack of Sharpies. But the fact that it’s doing a lot more than scribbling in a notebook, I’d say it’s worth it. Whether you’re after a back-to-school novelty item or date night treasure, the TPSY markers will suit your every need (and, yes, make that end-of-the-night kiss way sweeter). Makers of Padmavati finalize the teaser release date and here it is! Which Literary Festivals Should You Boycott? ASHLEY JUDD IS EARNING A DOCTOR’S DEGREE – AND IT HAS NOTHING TO DO WITH ACTING!